Barack Obama promised to remake America in his 2009 Inaugural speech. America is now poorer, less respected and $17 trillion dollars in debt. And the US middle class is no longer the most affluent in the world. The number of Americans who consider themselves middle class has fallen by nearly a fifth over the past five years. Obama put a pistol the head of the US Middle Class. Even the liberal media is starting to notice Obama’s destructive economic results. 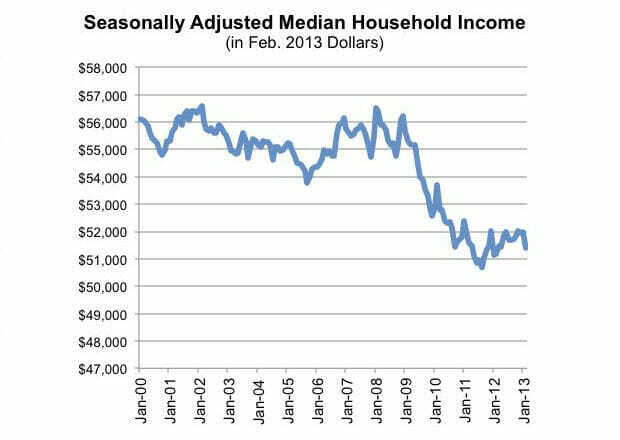 …for the middle class the scars of the recession still run deep. Federal Reserve survey data show families in the middle fifth of the income scale now earn less and their net worth is lower than when Obama took office. In the six years through 2013, over the recession and recovery that have spanned Obama’s tenure, jobs have been added at the top and bottom of the wage scale, a Reuters analysis of labor statistics shows. In the middle, the economy has shed positions – whether in traditional trades like machining or electrical work, white-collar jobs in human resources, or technical ones like computer operators. More… Today Republicans hold a 3-1 advantage in working class districts over Democrats.